The number of winding up orders made by the courts in the quarter was 783, substantially (26.3%) higher than in the previous quarter, but 6.6% lower than in the same period last year. 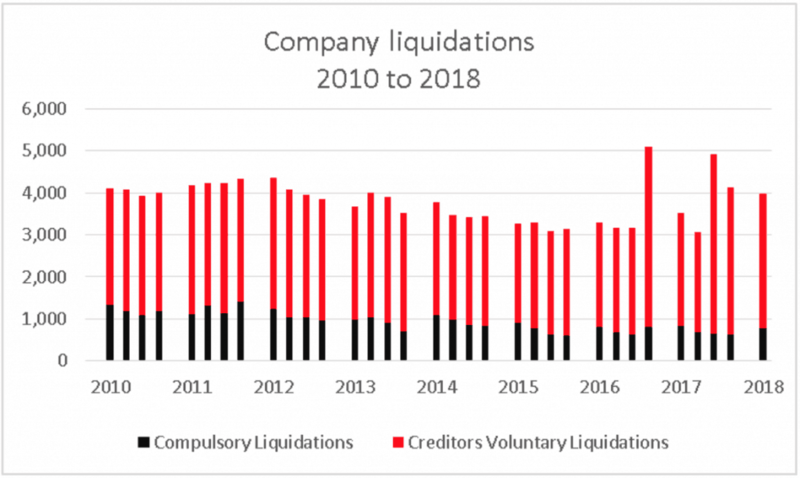 The number of creditors’ voluntary liquidations in the quarter was 3,209, a decrease of 8.9% on the previous quarter, but up 19.7% on the equivalent quarter of 2017. However, these figures should be treated with caution. 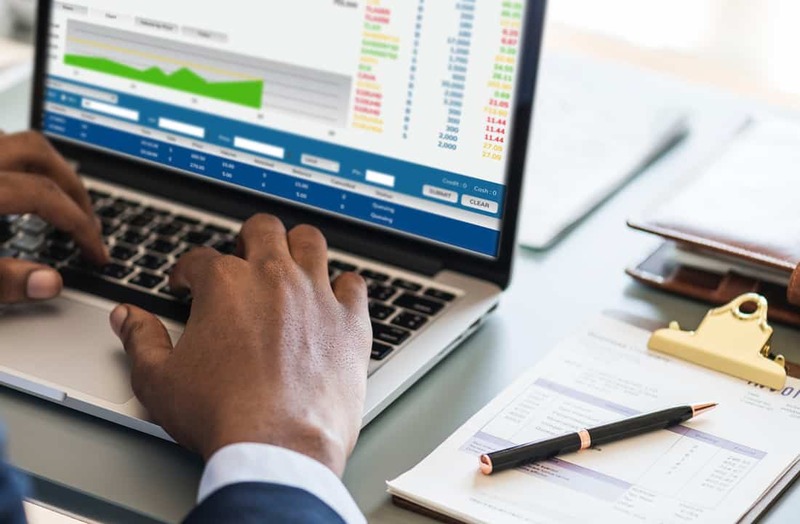 Following changes to the tax regime there have been instances of large numbers of connected personal service companies entering liquidation. Excluding the effect of these “bulk insolvencies”, the underlying figures show an increase of 7.8% on the last quarter of 2017. The number of receiverships, administrations and CVA’s registered at Companies House in the quarter was 470, an increase of 26.3% on the previous quarter. Overall the figures are up 5.6% on the comparable quarter of 2017. The number of bankruptcy orders made either by Office of the Adjudicator or by the courts against individual debtors in the quarter was 4,188, an increase of 9.6% on the previous quarter, and up 9.3% on the same period in 2017. Debt relief orders are available for individual debtors with few, if any, assets or surplus income and relatively modest liabilities. A total of 6,524 orders were made in the quarter, an increase of 1.3% over the previous period. The number of individual voluntary arrangements in the quarter was 16,676, up 8.3% on the previous quarter, and 8.9% compared with the first quarter of 2017. Recent months have seen a spate of high profile business insolvencies such as Toys R Us, Maplins and Carillion, with several other major names rumoured to be on the brink. It’s far from surprising, then, that the rate of both corporate and individual insolvencies stands at the highest first quarter figure since 2014. Having said that, the trend should be treated with some caution because some bulk liquidations, a result of tax changes and the liquidations of large numbers of connected personal service companies, have distorted the statistics for creditors’ voluntary liquidations (CVLs). Whilst the actual numbers of CVLs in 2017 Q4 and 2018 Q1 were 3,521 and 3,209 respectively, the underlying figures would have been 2,535 and 2,734. Unfair treatment of the Crown has been the top allegation for as long as records have been maintained. The definition ranges from cases where directors make a conscious decision to pay other creditors in preference to HMRC, to cases of deliberate fraud or attempted fraud. Remember that some disqualifications derive from more than one allegation. 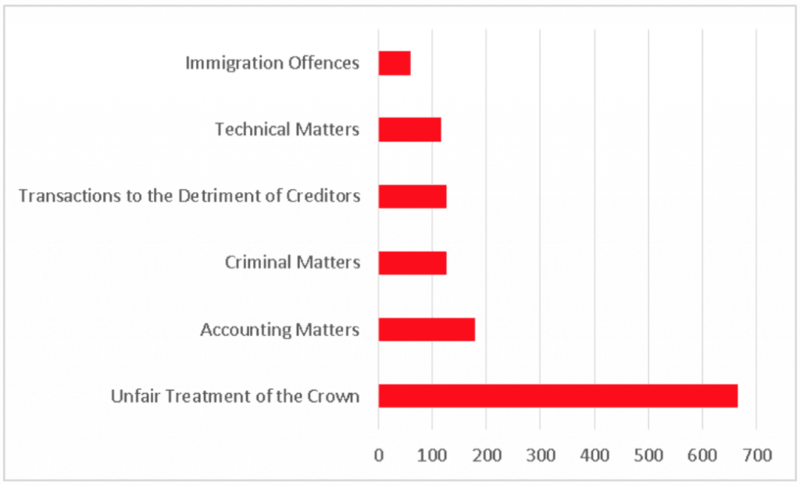 The chart does, however, perhaps reveal where the priorities of the Insolvency Service may lie. The GDP figures for the first quarter of the year were dismal on any analysis, but then Q1 GDP figures have a tendency to be disappointing. At least it may delay any increase in interest rates, although that must happen sooner or later and, when it does, could push struggling businesses with significant debt levels over the edge. 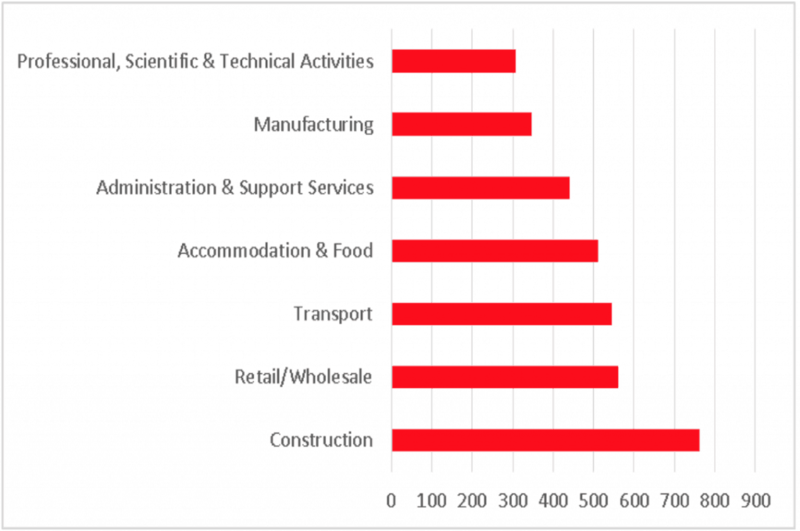 Retail, construction and real estate and professional services in particular face continuing problems. The fallout from the high profile failures has probably still to be felt in the supply chain. The schemes set up to help subcontractors and others in the aftermath of the Carillion collapse have undoubtedly helped prevent an immediate domino effect but is it just delaying the inevitable? We would simply reiterate our mantra that the earlier that struggling businesses seek advice, the more options that are likely to be open, and the greater the prospect of being able to salvage at least something. After falling year on year from 2010 until 2015, individual insolvencies increased in 2016 and 2017, and could well reach over 100,000 this year as consumers continue to feel the pinch with anaemic wage growth, inflation above target and consumer confidence still depressed. Total consumer credit debt (excluding mortgages) now stands at £209.4bn, an increase of £1.9bn in the last month alone; each adult in the UK now owes an average of £4,045. 26% of all issues dealt with Citizens Advice are debt related, up 6% in the last 12 months and second only to benefits and tax credits problems. Note that the published figures do not include individuals who are in debt management plans which, whilst statistics are not recorded, are thought to outnumber formal insolvencies several times over.